The X-MP’s main improvement over the Cray-1 was that it was a shared-memory parallel vector processor, the first such computer from Cray Research. 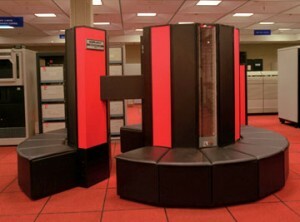 It housed two CPUs in a mainframe that was near identical in outside appearance, to the Cray-1. The X-MP CPU had a faster 9.5 nanosecond clock cycle (105 MHz), compared to 12.5 ns for the Cray-1A. It was built from bipolar gate-arrayintegrated circuits containing 16 emitter-coupled logic gates each. The CPU was very similar to the Cray-1 CPU in architecture, but had better memory bandwidth (with two read ports and one write port to the main memory instead of one) and improved chaining support. Each CPU had a theoretical peak performance of 200 MFLOPS, for a peak system performance of 400 MFLOPS. The X-MP supported 2 or 4 million 64-bit words (16 or 32 MB) of main memory in 16 or 32 banks, respectively. Memory bandwidth was significantly improved over the Cray-1—instead of one port for both reads and writes, there were now two read ports, one write port, and one dedicated to I/O. The main memory was built from 4 Kbit bipolar SRAM ICs. In 1984, improved models of the X-MP were announced, consisting of one-, two, and four-processor systems. The top-end system was the X-MP/48, which contained four CPUs for a theoretical peak system performance of over 800 MFLOPS. The CPUs in these models introduced vector gather/scatter memory reference instructions to the product line. The amount of main memory supported was increased to a maximum of 16 million words, depending on the model. The main memory was built from bipolar or MOS SRAM ICs, depending on the model. The system initially ran the proprietary Cray Operating System (COS) and was object-code compatible with the Cray-1. UniCOS (a UNIX System V derivative) ran through a guest operating system facility. UniCOS became the main OS from 1986 onwards. The DOE ran the Cray Time Sharing System OS instead. See the Software section for the Cray 1 for a more detailed elaboration of software (language compiler, assembler, OSes, and applications) as X-MPs and 1s were mostly compatible. In Jurassic Park, three Cray X-MP computers were used to maintain and run the park. The image shown below is of the XMP/48 which was in production from 1986-1990.